The clinical relevance of isolated tumor cell (ITC: ≤0.2 mm) and micrometastasis (MM: >0.2–2.0 mm) in axillary lymph nodes (ALNs) remains unknown. The aim of this study was to determine their prognostic significance. A total of 295 patients considered as pN0 after routine histological assessment, were reevaluated with ten-level cytokeratin immunohistochemistry (IHC) and two-level hematoxylin-eosin sections. Survival rates, i.e. 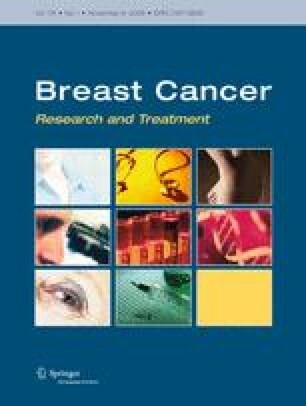 disease-free survival (DFS), distant disease-free survival (DDFS) and breast cancer specific survival (BCSS) were compared with those of reevaluated node-negative patients. A total of 84 patients (28%) had ITC/MM identified on IHC sections. ITC had no impact on survival at a median 8.2 years of follow-up, whereas MM showed a trend toward poorer DFS (P = 0.091, log rank) and DDFS (P = 0.066) and significantly reduced BCSS (P = 0.016). In multivariate analyses, detection of MM was an independent prognostic factor for DDFS (P = 0.025) and BCSS (P = 0.01) in adjuvant un-treated patients. Micrometastases (MMs) in axillary lymph nodes have prognostic impact. This was not found for ITC. This finding supports the use of systemic adjuvant therapy in patients with MM.